Lt. General Tukur Buratai, Nigeria’s Chief of Army Staff has called on media practitioners to collaborate with the army and other security agencies in stamping out insurgency and other security challenges across the country, Owojela’s Blog reports. COAS made the call on Wednesday at a three-day media workshop for the 2nd/3rd quarter 2017, held at Army Resource Center, Abuja. 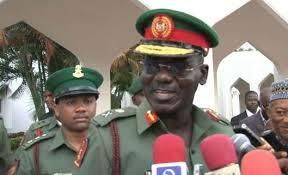 Buratai, who was represented by the Army headquarters Garrison commander, Major General, John Malu said “this workshop is apt, as it is coming at the time the army is engaged in counter insurgency operation in the Northeast East and other operations across the country”. According to him, the deliberations of the workshop will help the Army in improving human rights in its operations. Earlier in his welcome areas, the Direction Army Publishing Relations, Brigadier General Sani Kukasheka said the workshop was a forum for cross fertilization of ideas with a view to improving civil military relations and security of the nation. He enjoined the participants to make good use of the workshop in improving conflict information management.